If you're anything like me you like to shop locally, recycle where possible and try to buy environmentally friendly products but you probably also feel like you could be doing more. 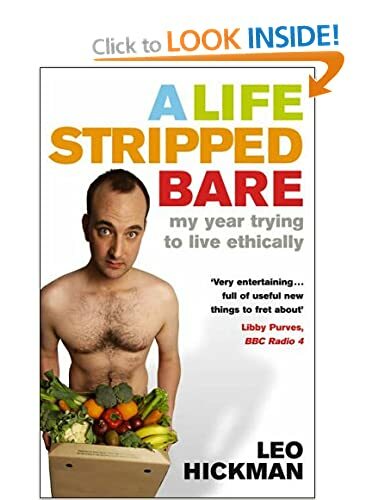 Too often convenience and cost (in my case, the lower the better) win out over the greenest option so I wanted to share a book and a film that changed my thinking and my behaviour. I read this a few years ago but a lot of it has stuck with me. It follows Leo Hickman's attempt to live a normal life but make all of his decisions ethical ones. He does an 'ethical audit' on all areas of his life including food, home and travel and looks for ways to live and shop smarter. It's a great book for anyone who wants to live more greenly by making simple changes and very funny too. I read this in a couple of days. This documentary follows Colin Beavan and his family who attempt to spend a year living their life with no environmental impact. They live in Manhattan so naturally it's a rocky year and some of the lengths they go to are fairly extreme. It's a great reminder that the lifestyle choices we make aren't always the best for our planet and left me thinking for a long time afterwards. Worth watching even if you're not interested in the environmental aspect solely for the fascinating insight into the way Colin and his partner Michelle handle the challenges the year presents them with. Do you have any tips for living a greener life?